The United States Mint will release the Ulysses S. Grant Presidential Dollar into circulation on May 19, 2011. This will represent the eighteenth release for the series overall. This issue might represent another highlight within the broader series, as Ulysses S. Grant is one of the most well known Presidents. He also currently appears on the $50 Federal Reserve Note. In the past, more popular Presidents have had higher mintages in anticipation of higher demand from the public. 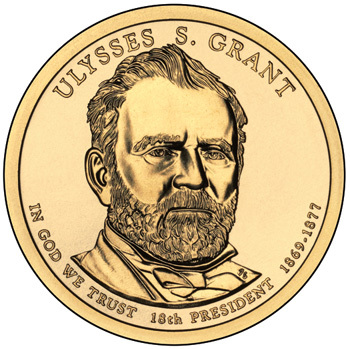 The obverse of the Ulysses S. Grant Dollar features the former President’s portrait. Inscriptions surrounding indicate his name, the motto “In God We Trust”, “18th President”, and the years of his two terms “1869-1877″. The reverse of the coin includes a depiction of the Statue of Liberty with inscriptions “United States of America” and the denomination “$1″. Both the obverse and reverse design and sculpting work was performed by Don Everhart. His reverse design is used for each coin in the series, and he has also designed many of the obverses. Collectors will be able to obtain the Ulysses S. Grant Presidential Dollars from banks or other financial institutions who place orders for the coins with their Federal Reserve branch. The United States Mint also offers products such as numismatic rolls and annual sets, which will include the new coins.